Style: From the Mirror, 8-14 June. Hello all! It's been a busy week for me, I've been launching my new business www.beckybarnes.co.uk - well I say new, it's really an extension of the work I've been doing already. Along with my writing work I'll be offering workshops on blogging for business and consultancy service on blogging and social media. So it's all rather exciting! In the mean time I thought we could do a wardrobe catch up and see what I've been wearing this past week! As always there are links to the items or those similar if you fancy a bit of a splurge! And while I've got you here, the good folk at ASOS are running their #MakeMeACurveModel competition again this year. The brief is quite specific, but... should you be aged 18-25 and a UK18 (There were no height restrictions on the press release so that's great!) then all you have to do is upload a full length portrait pic to instagram with the hashtag #MakeMeACurveModel. 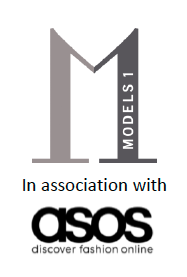 The winner will receive a contract with Models 1 Curve division, a day’s shoot at ASOS Studio’s modelling the ASOS CURVE collection and £500 ASOS vouchers. Ahh what and amazing prize! Good luck!